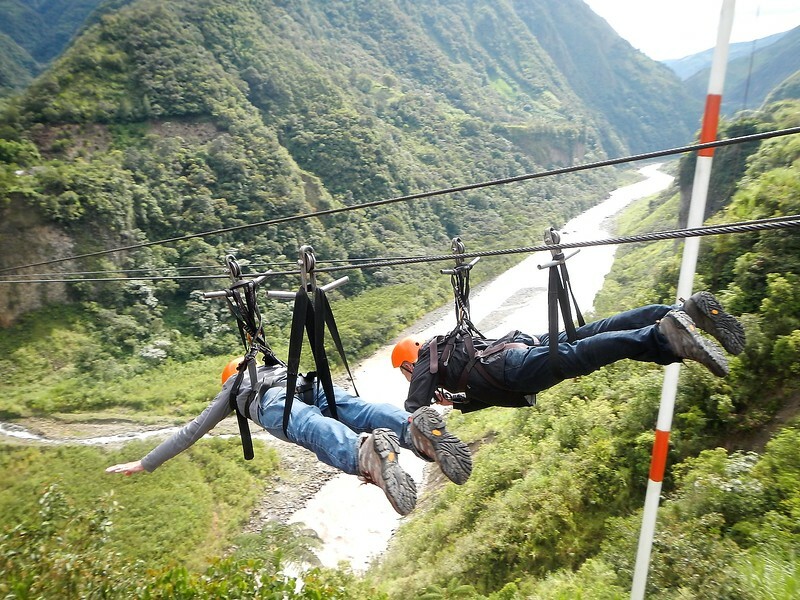 We stayed an extra day in Banos and decided to zip line across the canyon (Thanks for the tip Jeanne and Bo). 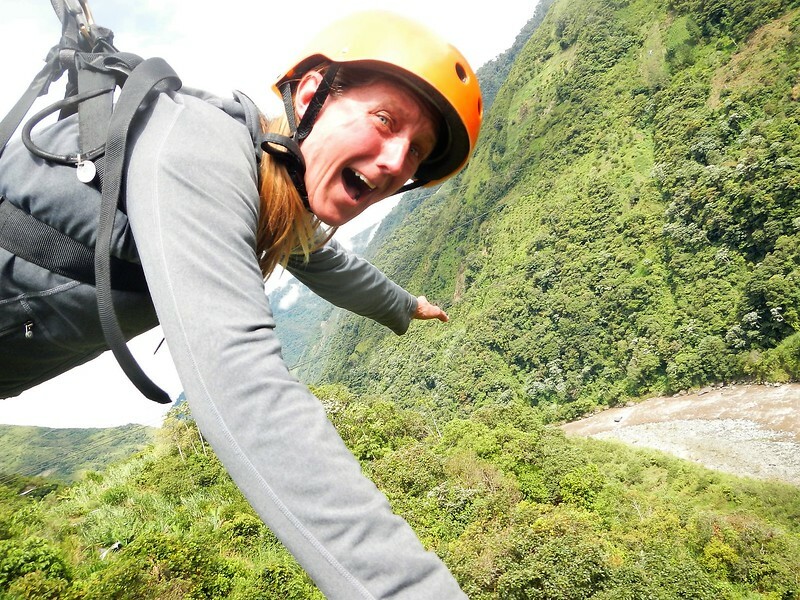 For $15 you can fly across this canyon. 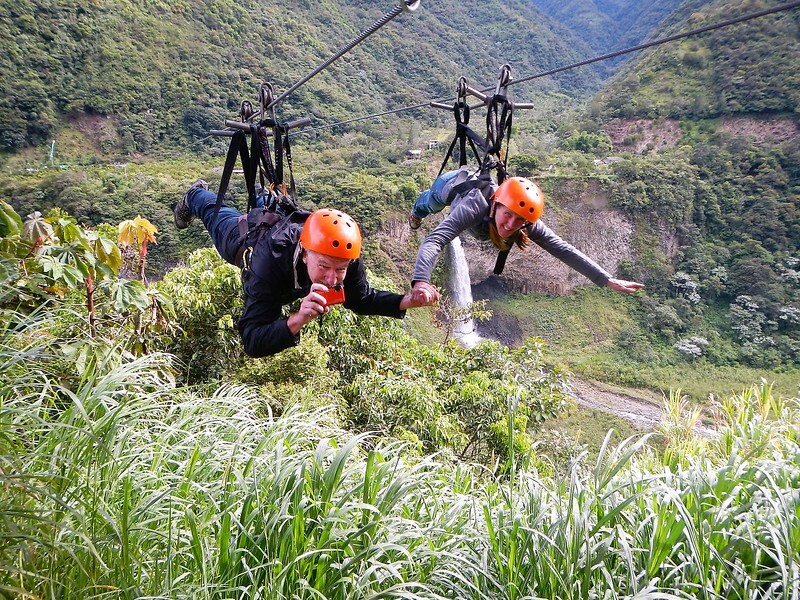 To make it real special they have side by side zip lines so you can hold hands (ooooooohh, how romantic). It wasn’t bad that we found another nice hotel…. even the muddy bikes looked happy parked in front. I don’t know, we thought it would be an easy day ride west towards the ocean from the town of Banos. We purposely took a little round about route that we read about in a tour book from the lobby of our hotel. Nice paved road through small villages that each specialize in certain crafts. We were getting tired of the cold and wet in the mountains and were looking forward to warmer weather that was reported along the coast. From Banos it was beautiful riding west until we caught up again with Panamerican highway where we turned north, skirted the big city of Ambato and kept going north a dozen or so kilometers past Catacunga where we would turn left on a road only known as “road” on my GPS. 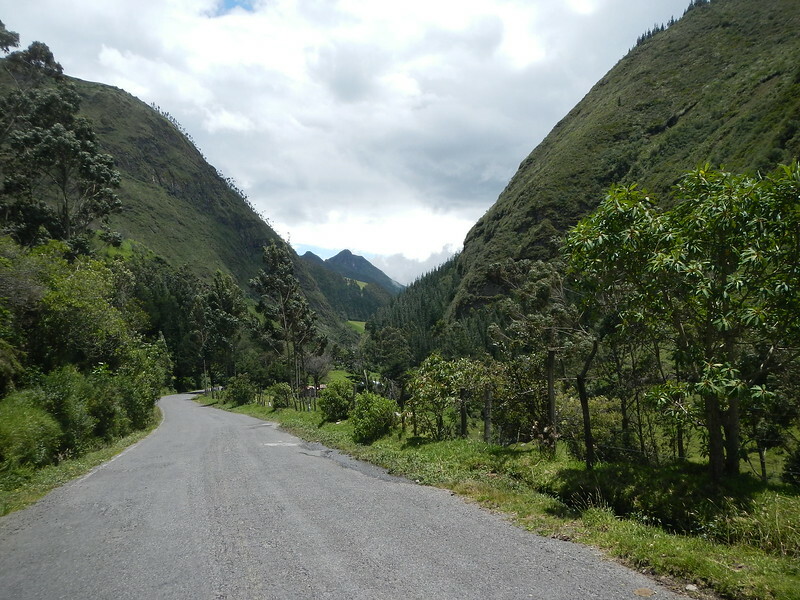 This road was nicely paved (until it wasn’t) and would eventually loop around to the Quilota caldera. 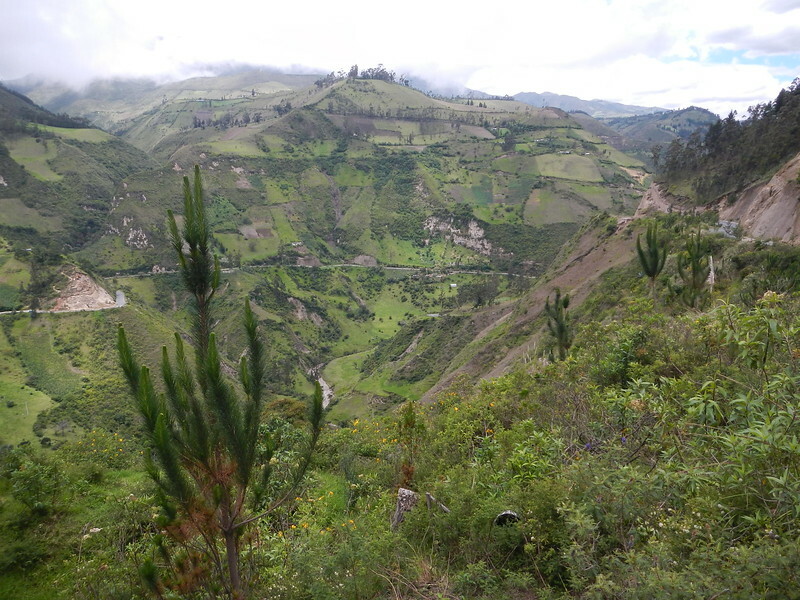 As usual the scenery was stunning, the wet climate meant lush green mountains sculpted by agriculture on the steep slopes. 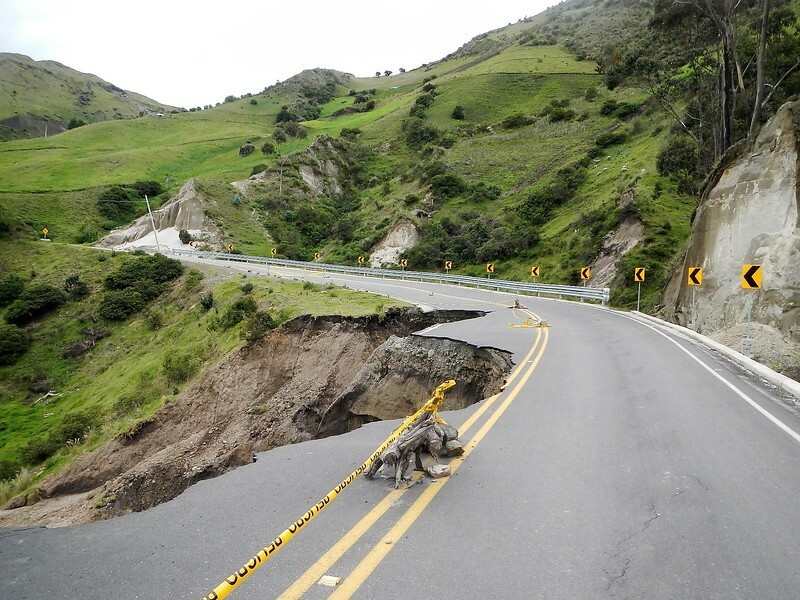 The road was relatively new but the engineering was maybe not up to par for all of the rain in the last few weeks. There were plenty of places where the road was mostly washed away and lots of mud slides across the road. After skirting around most of the slides we came to one that was about 20 feet deep over the road… We found our way around but it wasn’t easy. I summed it up in this short YouTube video. I tried to summarize maybe an hour of effort into a couple of minutes. It was tricky and probably more dangerous than I wanted to admit. I didn’t care what Deby wanted to do, I decided it would be best for me to ride her bike over the mud slide and then go back for mine. The video is a compilation of both bikes going over, I hope it makes sense. Needless to say we made it.. whew! 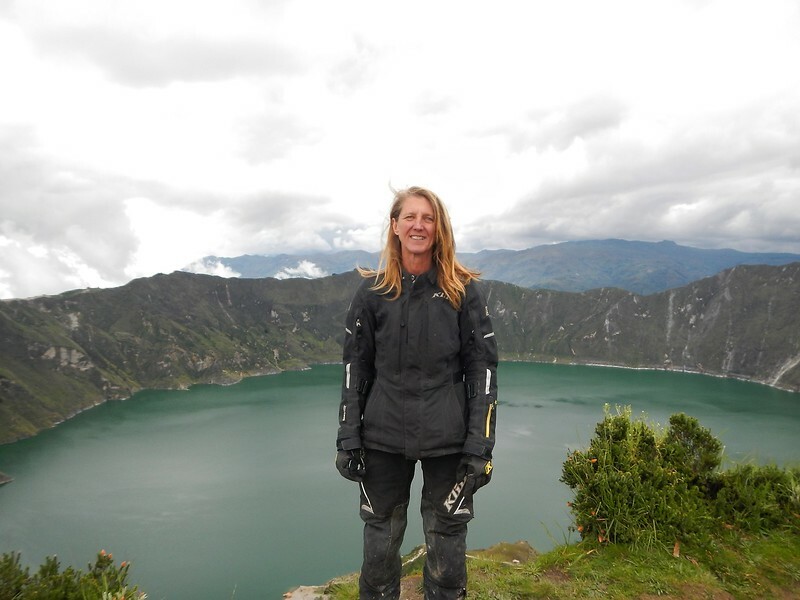 Another day at the office…..
About an hour later we came to the Quilotoa Caldera (click on the link to read more). It reminded me of our own Crater Lake in Oregon except maybe not quite as nice (…. Crater Lake is one of the most amazing places in my mind). We stopped for a few pictures and a short lunch. It was cold, burrrrrr. According to Wikipedia the caldera was formed by the collapse of a volcano following a catastrophic eruption about 800 years ago. 800 years? Geologically speaking that was like yesterday, wow. 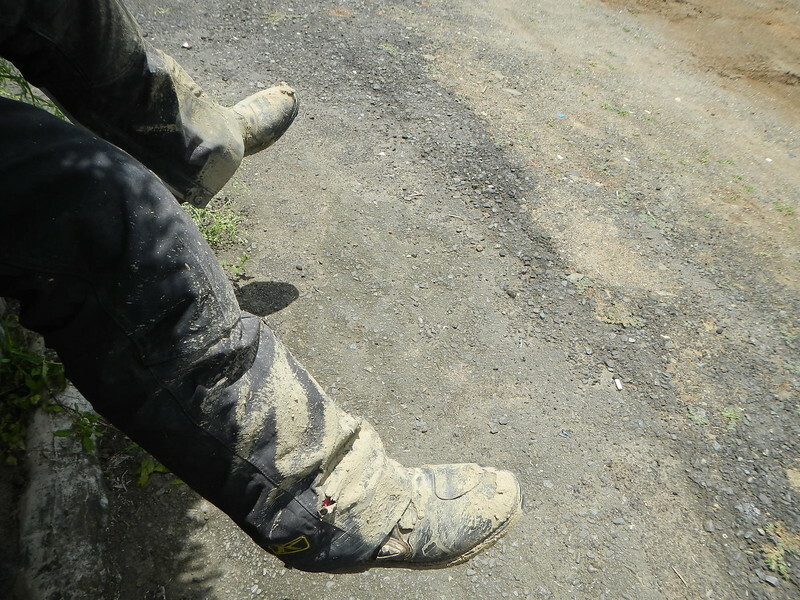 At the volcano we met two Americans riding two-up on a rented V-Strom. Of course we stopped to say hello and found out they were from Vancouver Washington. Wow, small world. Nice to meet you Bryan. Just south of the volcano the “road” connects with the main east west highway E40 and we were glad to start our decent from the cold air at over 12,000 feet to the warmth (and humidity we found out) of the Pacific Ocean coast. As we dropped it got hotter and hotter and hotter. Finally in the small town of Valencia I couldn’t take it any more and needed to pull over and remove my Gerbing heated liner and winter gloves and open all the available venting on my Klim riding gear. I pulled over in a random spot in the city where we immediately attracted all kind of attention like we usually do. No worries, we smile, say hello wave and blast off again. That didn’t work this time. Frustrated I try everything I can think of. The kickstand switch? Maybe all the water we’ve ridden through caused damage? Is the idle too high? I had to put in some low octane gas on our last fill up and the idle was running a little faster than I thought it should. Something else? I turn the key off and on, fiddle with all the switches and nothing. 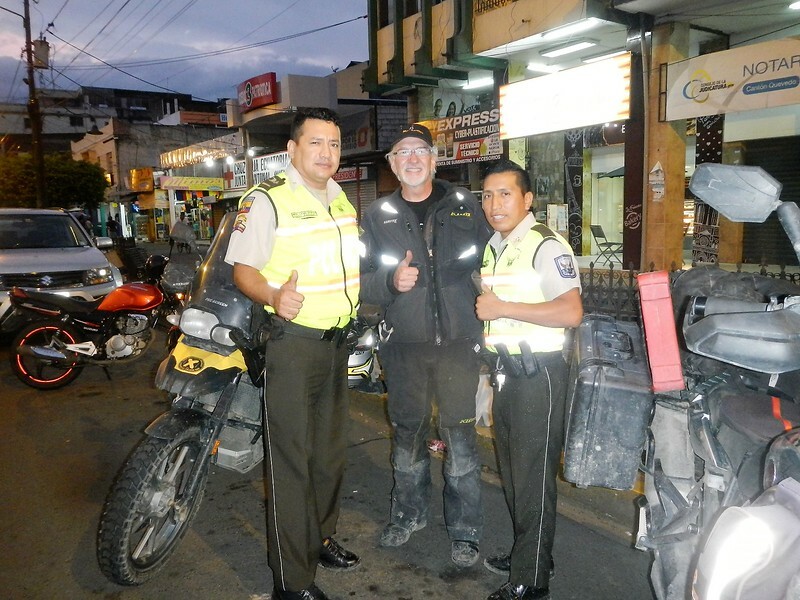 Let me say up front, these were two of the nicest and most helpful people we have met in all of Ecuador. They insisted on not leaving until they were sure we were safely situated for the night. After a long discussion we somehow concluded that the best course of action would be for them to tow me to a motorcycle shop belonging to a friend or relative, not sure which. So as the darkness was settling in we attached my short piece of emergency tow rope to the back bumper of the police pickup truck and off we went. Lights, siren and all. I wish I had a picture but didn’t dare ride with one hand. My motorcycle was only about 5 feet from the back bumper of the police truck and there was not much room for error should they decide to speed up or, even worse, slow down. Then I noticed the truck didn’t have functioning brake lights. Yikes! Ok, this was crazy. They ran all the red lights with their siren and lights on because it was probably safer. I had no choice but to follow the best I could. Evidently the police didn’t think Valencia was the best place for me to be either because they dragged me over 10 miles to the larger city of Quevedo. As we neared the edge of town and the traffic was picking up there was a point where they had to slow down before I could react and (you knew this was coming) the slack rope got stuck under my front tire. Wham, bang, shutter the bike flipped and flopped, I could hear Deby screaming in my ear and suddenly the tow rope broke and I somehow didn’t crash. I did decide to coast to the side of the road to collect my wits. Everyone stopped and came running over – you ok? Um, yea, but it did freak me out a bit. Right then I decided to try the handlebar switch and guess what? It kicked into gear just like normal. Go figure…. The police insisted we follow them into town to the best hotel they knew of, we were thankful for that. When we got there we all gathered for pictures, e-mails, websites and general thanks and gratitude. These guys really were fantastic and I expect they are looking for their picture in the blog…. here it is guys. Muchas Gracias Amigos! 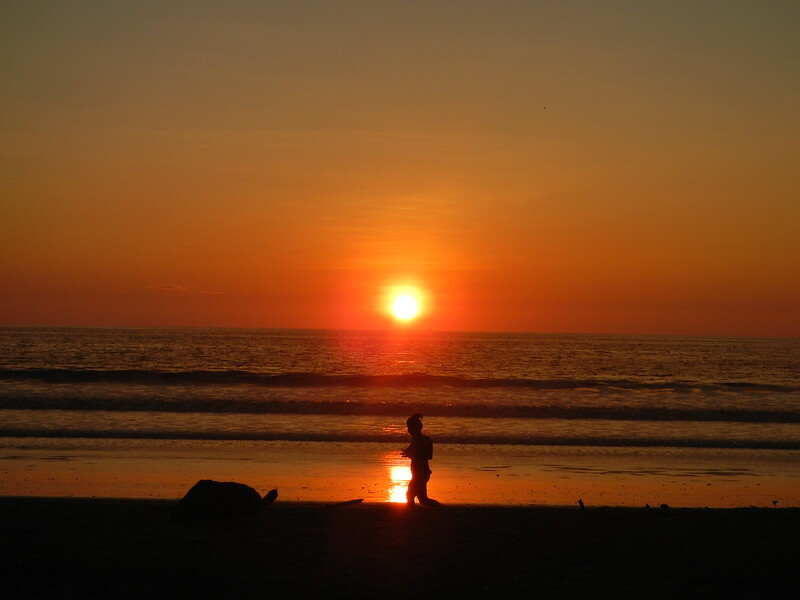 162 miles from Quevedo to the coast on one of the main highways in the country… how hard could that be? We got our of Quevedo early just wanting to get to the coast where we had reservation at the Hosteria Mandela in the beautiful port city of Puerto Lopez. 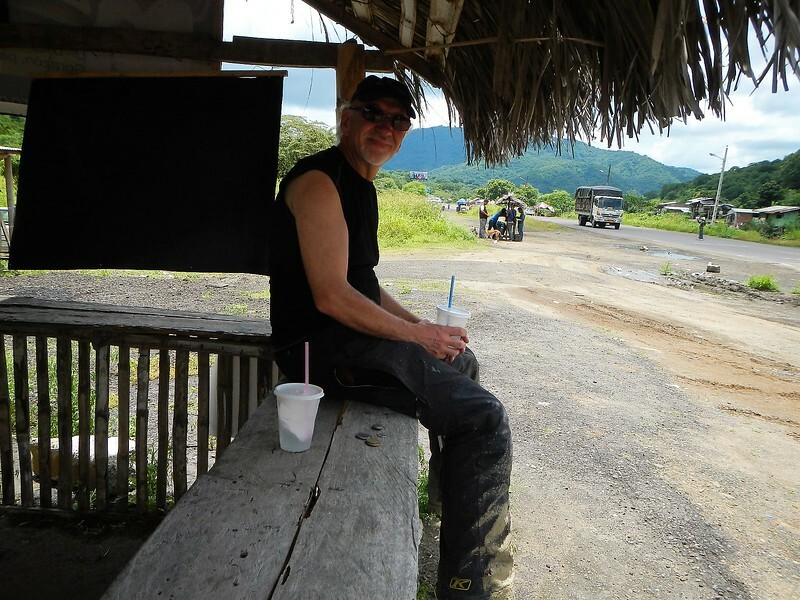 Not long after we left Quevedo the pavement ended, the road was under construction. Oh… and it rained during the night so you know what that meant….. mud mud mud…. I was concentrating too hard to take pictures, we just laughed and slogged through about an hour of mud. Finally when the road switched to pavement we stopped at a speed bump where they were selling coconut juice for a break. 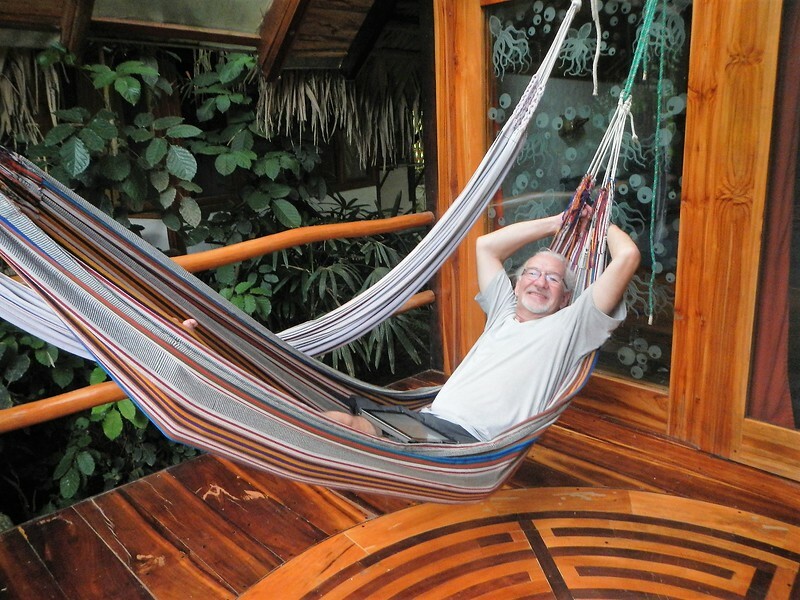 Yes, Hosteria Mandala in Puerto Lopez, on my list of highly recommended places to stay. We spent two lazy days with long walks on the beach, hours in the hammocks reading books and slow meals at the beach side restaurant. No mud. 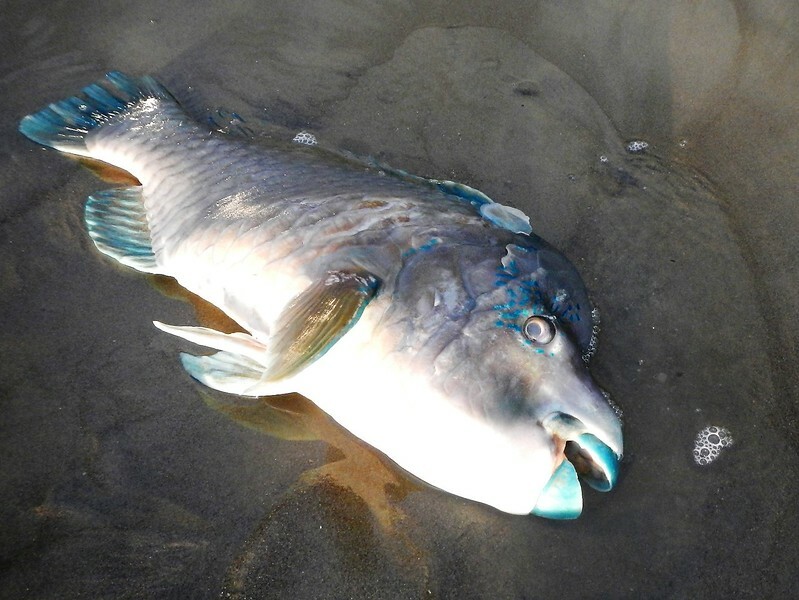 I have to show this picture… this fish washed up on the beach. It must have just happened. Look at the color, wow. 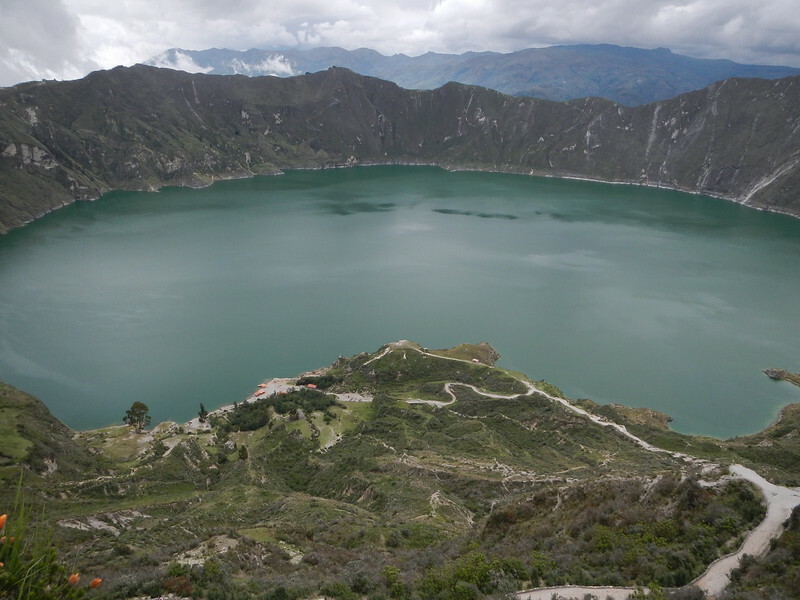 Tomorrow we leave for the big port city of Guayaquil where we will spend the night and then catch a plane early Saturday morning for the Galapagos. Once there we will board a boat for 5 days touring the islands. We were warned, no internet, no cell service, nothing. So I’ll be going dark for a week or so…. 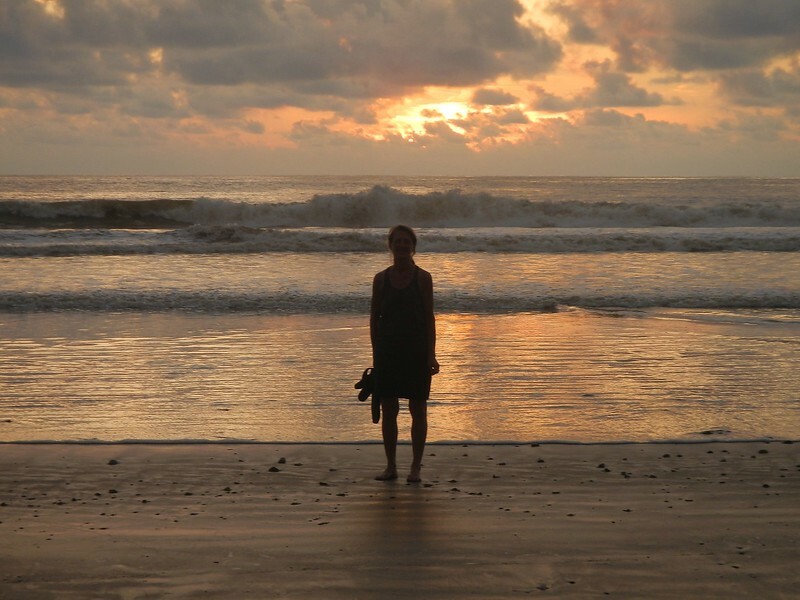 I’ll end with a nice picture, our first time this whole trip spending any time on a warm beach. Sorry Seattle friends if this hurts but we’ve had our share of rain as well. 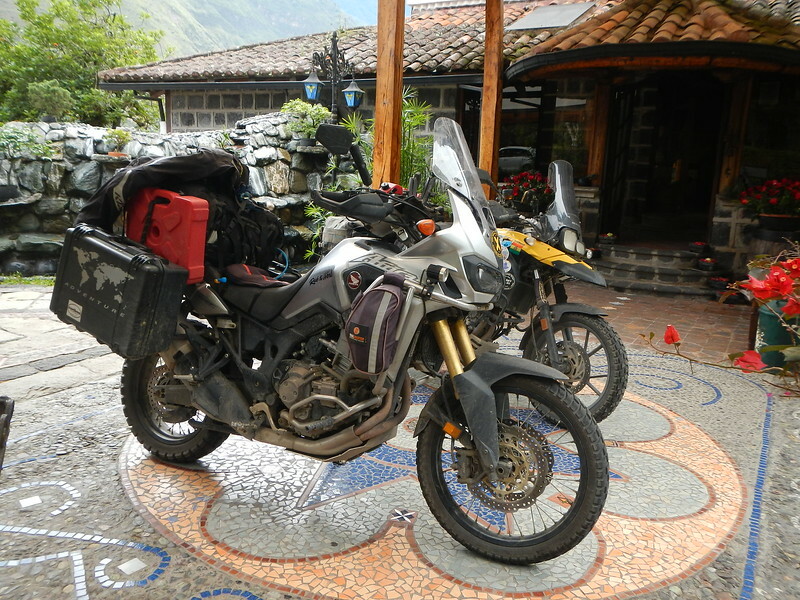 This entry was posted in Motorcycle Adventure by donnh. Bookmark the permalink. We stayed at the Hosteria Mandela too! The owner and his wife were just leaving for Europe to see his first grandson. Great place! Nice to see you two getting a break from your adventures. Have a great time in the Galapagos! What a trip! I’m speechless.